Currently, most Flow notifications only put the topic name in the header, and put the actual text of the notification in the body. All other notification types outside of Flow put the notification text in the header and use the body for snippets/excerpts/summaries or other such auxiliary information. It's even inconsistent within Flow, because the bundled versions of these notification types do put the message in the header. We'd like to remove this inconsistency by always putting the notification text in the header, and using the body for snippets where applicable. Additionally, we'd like to remove the user name from the notification text, and instead put that information in the first secondary link. The same goes for the name of the page (Flow board) in most cases. Header: New topic created on <Page name>: "Topic name"
Header: <Username> replied in "topic name"
Header: N new replies in "topic name"
Header: The topic "old name" was renamed to "new name". Header: <Username> mentioned you in "title name"
Body: Excerpt of the mention, with words surrounding and including the mention. The icon for the user name secondary actions is userAvatar, the one for Flow boards is speechBubbles, and the one for the user talk page (in flow-enabled-on-talkpage) is a new one that Pau hasn't yet uploaded an asset for AFAIK. Catrope added subscribers: Catrope, Pginer-WMF. @jmatazzoni suggests that for flow-post-edited, we may want to link to the diff of the edit instead of / in addition to linking to the board. Thoughts? Agree, it should link to the diff. Primary link should either be direct post (not just topic) or diff. Note that once we get some clarity on which is the official user icon (T115419#1900484), we may need to update one or the other. SBisson added subscribers: Elitre, StudiesWorld. I started checking @Etonkovidova's screenshots above from the bottom up, last to first, so that's how these notes are ordered (sorry). Since I wasn't sure if the same person will be working on all these different notification types, I repeated the remarks about formatting, etc. -- many of which apply to nearly all of the examples -- so that these notes could function as checklists. Hope that's helpful. The spreadsheet shows a secondary link to the usertalk page with the new "user talk" icon. user talk page should be in bold. Not seeing the excerpt in any but the example 2. Why? Missing the secondary link with the pagename of the page in question. This time we're missing the secondary link with the username, but we have the link with the pagename. @Pginer-WMF, have a look at the secondary link here; are you truncating the secondary links enough? Missing the excerpt for this multiple version. page name should be boldface. jmatazzoni moved this task from Blocked to RFP (cross-wiki notifications) on the Collaboration-Team-Archive-2015-2016 board. jmatazzoni moved this task from RFP (cross-wiki notifications) to Ready for pickup on the Collaboration-Team-Archive-2015-2016 board. Bolding is done in T121724, where I'm waiting for a confirmation before reworking it. Excerpts are truncated in CSS per @Pginer-WMF's recommendation here T121822#1910033. It ensures that it fills exactly one line of the available space. As a result, quotes are difficult to insert but we can try to find a clever solution. @Pginer-WMF, any special i18n considerations for quotes? The notification body color was identified as #888 in https://gerrit.wikimedia.org/r/#/c/260058/ What should it be? Good question. @Etonkovidova, what exactly did you do? It's a bundled notification. There are multiple users. Which one would you expect to see here? There are multiple replies. What would you expect to see here? The other 3 examples look like mentions in the topic title. There is no excerpt for topic title mentions, because the title is already in the notification text (so the excerpt would just be a duplication). Do we want an excerpt there as well? My mistake. There's no call for a username link for the bundled version in flow-post-reply. 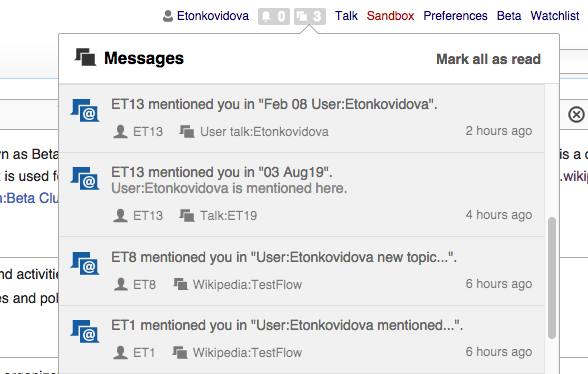 Second screenshot: User ET58 replied on User talk page ET70 in topic that is watched by Etonkovidova(that's why Etonkovidova received the notification). Secondary link to Talk:ET1 page is present. Secondary link to User talk:ET70 page is present. Secondary link to User talk page is present. the spec shows no secondary link to the user talk page. Please remove. 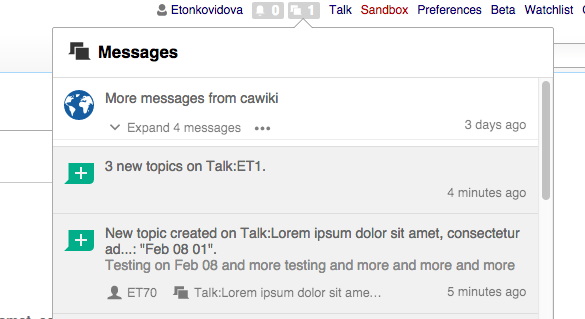 flowusertalk-new-topic is not a separate notification type but a special case of flow-new-topic, which has a link to the Flow board. Any strong reason to have the link in one but not the other? None that I can think of. I've added the secondary link to the spec in the spreadsheet and added a note there asking for comment. I'll leave this ticket open for another day or so, in case anyone remembers why we made that call. If no one speaks up, we're done. Anyone? @Pginer-WMF? I think it makes sense to keep them consistent, with the board (the talk page in this case) available to provide context. Closing this ticket. Thanks all. jmatazzoni added a subscriber: SBisson.